Police were called to the 200 block of Arcadia on December 31, 2006, to investigate a report of theft. There were no arrests. Police were called to the 200 block of Arcadia on January 2 to investigate a residential burglary. A washer and dryer, 4 light bulbs, and two unknown brand white air conditioning window units were reported missing. Bradley Stewart, 41, 414 W. Lincoln Hwy., Chicago Heights, was arrested and charged with criminal damage property on January 4. Police were called to the 200 block of S. Orchard to investigate a report of a shattered vehicle windshield. Police were called to assist the Park Forest Fire Department with a structure fire in the 200 block of Arcadia on January 4. The house was vacant. Police were called to the 300 block of Sauk Trail on January 8 to investigate a report of criminal damage to property. The driver door window of an automobile was reported shattered by juveniles. There were no arrests. Police were called on January 8 to a residence in the 200 block of Arcadia in reference to a reported home invasion where the offenders were armed. Two alleged suspects had fled the residence by the time police arrived. The suspects had entered the residence after yelling, “Get down, get down, police, police.” A wallet containing $850 was reported taken by the suspects. There were no arrests. Police suspect that this was a random home invasion. Police were called to the 400 block of Miami on January 8 to investigate a report of criminal damage to property. The front driver door window of an automobile was reported shattered, as well as a taillight. A juvenile was arrested and charged with aggravated assault on January 9 in the 300 block of Oakwood St.
Marchaz Glass, 18, 129 Shabbona, Park Forest, was arrested and charged with an attempt residential burglary on January 9 in the 100 block of Shabbona. Brandy S. Bramlet, 27, 10912 S. Sangamon St., Chicago, was arrested and charged with driving under the influence of alcohol on January 10 on Western Ave. near Monee Rd. Police were called to the 200 block of Gentry on January 11 to investigate a burglary to motor vehicle complaint. $10 to $15 in loose change was reported missing. Officers were called to the 100 block of Hemlock to investigate a possible residential burglary because of a broken basement window. There were no arrests. Police were called to the 400 block of Talala on January 12 to investigate a possible battery incident. There were no arrests. Police were called to the 100 block of Shabbona on January 12 to investigate a report of criminal damage to property. A window of a residence was reported broken. Quincy A. Harris, 24, 3140 London Drive, Olympia Fields, was arrested and charged with possession of cannabis on January 12 after the vehicle he was driving was pulled over when it was observed by an officer driving “…at a high rate of speed northbound on Western Ave., causing the vehicle’s tires to squeal for about 100 feet,” according to the police report. Police responded to a burglary report at a business in the 400 block of Sauk Trail on January 13. $300 in quarters and a box in scratch and win lottery tickets were reported missing. Police were called to the 200 block of Arcadia on January 13 regarding a residential burglary report. Nothing appeared to be missing. Walter L. Proffitt, 54, 9 Bender Rd., Park Forest, was arrested and charged with disorderly conduct on January 12. Charles E. Young, 50, 47 Indianwood, Park Forest, was arrested and charged with assault in the first block of Indianwood on January 13. A juvenile was arrested and charged with illegal possession of alcohol on January 13 when police were called to the 100 block of S. Orchard to investigate a theft complaint. Police were called to the 200 block of Juniper on January 13 to investigate a reported battery. There were no arrests. Gregory D. Barksdale, 37, 850 Sandra Dr., #2c, University Park, was arrested and charged with possession of cannabis on January 13 when his vehicle was pulled over for allegedly exceeding the posted speed limit on Western Ave. south of Sycamore Dr.
Michael A. McNeal, 48, 42 Apache, Park Forest, was arrested and charged with domestic battery on January 14 in the first block of Apache. Christopher G. Santiago, 18, 110 Warwick Dr., Park Forest, was arrested and charged with possession of cannabis on January 14 in the first block of Birch St. when police were called to investigate a report of a suspicious auto. A police officer took a complaint of domestic battery at the Park Forest Police Station on January 14 for an incident that allegedly occurred earlier that afternoon. Lisa A. Griffin, 17, 1236 Otto Blvd., Chicago Heights, was arrested and charged with obstructing justice on January 14 during an investigation of a possible burglary in progress in the 300 block of Niagara. Police were called to the 300 block of Sauganash St. to investigate a fraud complaint on January 14. A resident reported receiving a collection notice for over $800 for an account the resident never opened. 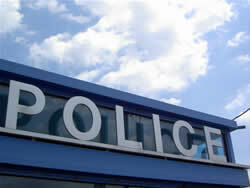 Police were called to the 200 block of Forest on January 14 to investigate a report of burglary from a motor vehicle. Two CD storage notebooks containing approximately 150 CDs and a radar detector were reported missing. A juvenile was arrested and charged with disorderly conduct in the 200 block of Allegheny when police were called to that area to investigate a fight in progress. Police were called to the 300 block of Oakwood to investigate a complaint of criminal defacement on January 15. Gang graffiti was painted on the side of a house. Police were called to the 100 block of Warwick to investigate a report of criminal damage to property on January 15. A tail light on an automobile was reported shattered. Johnnye M. Rebb, 11431 S. King Dr., Chicago, was arrested in the 400 block of Shabbona and charged with criminal trespass to real property (property that is not inhabited) on January 17 when police were investigating numerous residential burglaries in the area of Nauvoo and Tomahawk. Jose D. Oliver, Sr., 41, 9 Apple Ln., Park Forest, was arrested and charged with domestic battery on January 17 in the first block of Apple Lane. Police responded to a fraud report in the first block of Krotiak on January 17. A resident received a bill of $462.89 for an account the resident did not open. Jessie J. Deloach, 34, 200 Indianwood, Park Forest, was arrested and charged with retail theft for allegedly taking hats from a business in the first block of S. Orchard on January 18. Investigation Continues: Reported Arson/Suicide on Monee Rd.